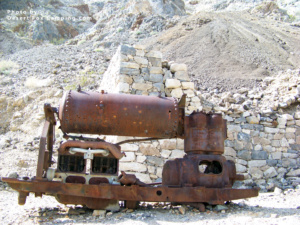 The desert mountain ranges going into Death Valley contain many canyons where old mine shafts, cabins, millsites and various ghost towns of past mining operations lay silent to be discovered by the exploring traveler. One such place of interest is the Minnietta cabin and mine in the Argus range. 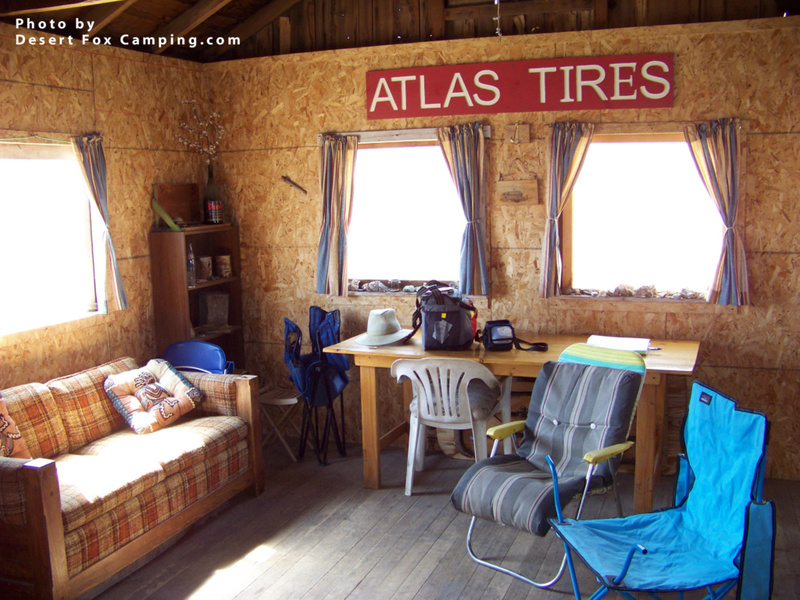 The well maintained cabin is one of the many mining shacks in the Death Valley area adopted by off-road groups. Travelers caught in the harsh elements can find a place of refuge, or like us, simply camp in our truck nearby to enjoy exploring the ruins and equipment abandoned where it was last operated. The type of equipment spans the century from old west wood trams and iron rails to 1940s and 50s boilers and trucks. Rust comes slowly in the dry desert leaving the ruins preserved for the history buff to puzzle out how the mines were operated. My hubby once worked as a stationary engineer and he loves to examine the old steam boilers and machinery closely. An old concrete foundation where a house or workshop once stood serves as a great spot to park our truck and oversee the surroundings that grow eerie as the breeze rustles through loose tin and decaying boards in the night. Lonesome brays of Jacks looking for company echo in the area. Bats leave their mine shaft homes to flit nearby in the evenings. The milky way can be enjoyed from the dark sky away from city lights. We enjoy a campfire in our Smokey Joe BBQ that is small and portable but large enough to cook 2 steaks with our favorite camp potatoes. We smoke cigars as the glow of the embers die down and enjoy the serene quiet of the desert. I always look forward to our tradition of Pres reading to me while snug in our sleeping bag by flashlight. We usually bring a Louis L’amour book and have been delighted to find that at times we have explored in an area that is described and used in his historical fiction, bringing it to life. One morning after camping at Minnietta overnight, we headed out Shotgun Road towards the Panamint Resort. We were shocked to find a dead burro laying beside the road with his throat deeply slit as if by a hunting knife. We reported our findings to the Resort who told authorities. It remains a mystery as to how the burro got this type of deadly injury. It heightened my awareness of the possibility of meeting a person of ill intentions while traveling alone in the back country. My grandparents were rock hounds and I loved my trips to the Texas desert with my grandfather to find rocks. Grandaddy would have loved the variety of the kinds of mines in Death Valley – gold, silver, lead, talc, sulfur, borax, onyx, etc. I always keep my eye open for that gold nugget left behind, but so far only the “fools gold” of pyrite has been my find. You can reach Minnietta coming from the south via Trona Wildrose Road or Panamint Valley Road from the north. There are several ways into the canyons but the most direct is via Minnietta Road, a graded dirt road that turns off the pavement with a marked signpost. Detailed directions are offered in the Death Valley SUV Trails book by Roger Mitchell. Also noteworthy is the ghost town of Ballarat, which lies southeast of Minnietta with a clearly marked turn-off along Trona Wildrose Road. The neighboring canyons can be reached via the rutted Shotgun Road which offers great 4×4 roads into Snow Canyon with the St. George mill site and old tin roof cabin. Head north to Lookout City with a panoramic view of the valley from its rocky ruins, then on to the Osborne Canyon with its zebra striped limestone formations. Osborne is where the Surprise Mine cabin sits with a picturesque dinosaur back ridge behind it. Good short story about one of several cabins in the Argus Range. The Ridgecrest BLM sponsors the “Adopt-a-Cabin” program to supply material to volunteers. I am very familiar with the local BLM Ranger (Terry Allan) and always look forward to his visits in the back country to see what I am up to. Slept many a night under my truck shell but as of late I have upgraded to a Four Wheel Camper in a Tacoma, am loving it! Happy camping and if our trails cross we will have a lot to talk about. Thanks for the info about the “Adopt a Cabin” program! I so appreciate the work of the volunteers to maintain these structures from history. We come across many cabins in the back country, with some not so fortunate to be cared for. Enjoy the luxury of your truck camper!